North America's favourite Keurig coffee machines are available in the UK/Ireland and we are delighted to be one of a limited number of of Keuirg UK/Ireland distributors. Keurig K Cups offer large, high quality drinks and some of the best loved brands including Starbucks coffees, barista Prima and Twinings Teas so its unsurprising that Keurig coffee machines are receiving a phenomenal response in the UK/Irish market. The Keurig K Cups are sealed, airtight pods that contain the finest of beans that have been expertly ground and measured to create the perfect cup of coffee, every time. There is a great variety of K-Cups to choose from, so there’s bound to be something to satisfy everyone’s tastes. As well as multiple varieties of gourmet coffee, the range includes an incredible selection of teas as well as hot chocolate. There are two Keurig Coffee Machines in our range. The Keurig K140 machine is the standard model. Small, compact and reliable, it’s the ideal solution for smaller businesses, individual offices, conference rooms, and waiting areas. If you have a bigger workforce – or more demanding clients – the Keurig 150P machine is a larger, more sophisticated version of the Keurig K140. It is the perfect choice for most any business or professional environment. 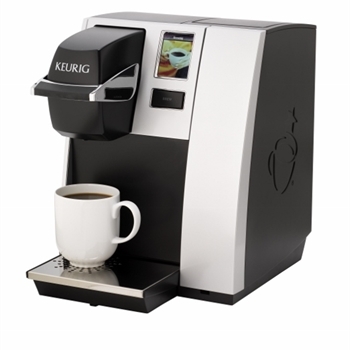 The Keurig K140 machine is the perfect coffee pod machine for very small businesses, individual offices, conference rooms and waiting areas. Offering a huge choice of drinks including teas and hot chocolate, and with adjustable brew sizes and an easy-to-refill facility, this small office coffee machine is incredibly simple and reliable and will fit in almost anywhere. 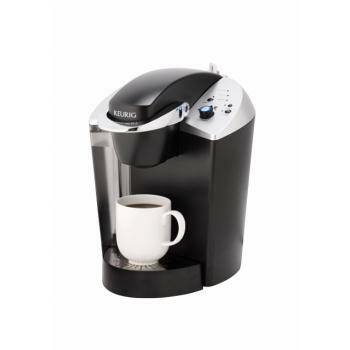 For more capacity between refills or the option to plumb, consider the Keurig K150. Ratio Vending is an authorised Keurig UK Distributor.